September 26, 2014 By Tina M 57 Comments This post may contain affiliate links. Read my disclosure policy here. Good News! We are giving away a Pikle this week! Don’t know what a Pikle is? Your life is about to change! Read on…. 1. Swaddle Wraps or a minky blanket. I couldn’t bring myself to buy these for our first baby, because I figured I could do just as well with blankets. Someone gave me some swaddle wraps for my second baby and they changed my world! It’s was so nice not having to get up in the night in my already sleep-deprived state, just to re-swaddle my baby. 2. A wrap/Carrier. This is another thing that I couldn’t justify buying myself, but when I borrowed one of my friend’s wraps I loved being able to carry my baby around in it. 6. A Video Monitor. This is another thing that would have been really awesome to receive! I bought an old used monitor at a yard sale because I couldn’t justify spending the money, but I would have slept so much better had we had one. I woke up so many times in the night wondering if my baby was still breathing, or if she was okay, or why the house was so quiet. I would have saved myself from waking her up from her nap had I been able to peer at the video monitor to check on her rather than walking into her room. 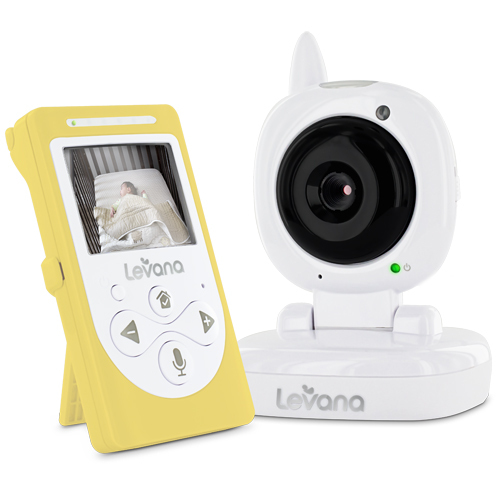 I recently got the Levana Sophia video monitor, which is both awesome and affordable. Oh man am I glad to see that you think minky blankets are nice for baby showers….I’m about to make one for a baby shower right now! I love the pepper light blue pickle. I agree with the BOWS! I only got like 6bows which wasn’t as much as I thought. She outgrew 4 after 2months. I have been making them for my baby girl & baby showers. Dill Blue Floral with Yellow Chevron Pikle – these are so cute and look so handy! I like the Bread & Butter Pikle! I would buy the starter kit with it because I will be going on vacation soon and don’t know exactly what I would need! I love the paisley pikle bag. Would love to win one! Love the pepper black pikle! Great idea for all of the essentisls… bandaids, kleenex, tweezers, hair bands, and more! Great idea! I love the blue floral with yellow chevron. One of my New Years goals was to be more organized. A Pikle sounds perfect for that! If I win maybe the next time I have a newborn I won’t be caught using wet paper towels in a public restroom to clean poop off my kid. Maybe. I’d love the SWEET BLACK AND WHITE FLORAL WITH LIME GREEN PIKLE with the MACGYVER PAK, tweezers, and the tool card. The PIKLE looks so nice! I like the bread and butter saddle black! I’ve seriously wanted one of these forever! Gherkin gray with pink stripe. I like the sweet chevron with coral pikle. And I love the idea of keeping it in the car as I *someday* hope to stop carrying a huge diaper bag! I’d fill it with first aid, cleaning, and a few small snacks. These are so cute! I think I’d want the Bread & Butter Black and White Stripe with Pink Pikle. I’d definitely like the starter pak and then would add chapstick, medications, and a travel battery charger for my phone, to start. I would love the pepper light blue pikle. I love the sweet pikle chevron with coral flap or the B&W floral with lime flap! Both are so cute! And inside I’d want…tweezers, finger nail clippers, hand sanitizer, spot remover, mini scissors, and tissues. Actually all of it sounds SO handy! SWEET BLACK AND WHITE FLORAL WITH LIME GREEN PIKLE! Dill Pikle – Green Circle. I love and need one of these! Love the Dill Paisley with Coral. What a great little system of all the things a mom NEEDS in her purse!!! I love everything that is in the starter pack and would really like the Sweet Black and White Floral with Lime Green Pikle. Thanks for hosting such a great give away! I like the Dill Green Circle Pikle. And I would definitely want a starter pak. Lots of stuff I would use. Thank you so much for this opportunity! I would want BREAD & BUTTER SADDLE BLACK PIKLE and for it to be filled with the complete refill/starter pak. Not sure if I was looking at it all correctly but I couldn’t see everything that was in the refill kit. So if these items aren’t in it, I would love them too. An eye see you pak, and a MacGyver pak, and extra of those thermometer strips. How handy those would have been over the years! My favorite is the Sweet Pikle- Chevron with Coral Flap. I love that they look like a makeup bag but carry tons of stuff you may need on the go. I would love the bread and butter saddle black pikle with the starter kit. What a cool idea. Why didn’t I think of that ? I like the Bread and Butter Cocoa with the starter pack and skout pack!! Any of the dill pikles are wonderful. Especially like the dill paisley with coral dots pikle. Thanks for the chance! These sure are super cute!!!!!! I would love the SWEET BLACK AND WHITE FLORAL WITH LIME GREEN PIKLE fully loaded! Sweet floral purple pickle starter kit!! Multi stripe with aqua flap sweet pikle! I love the SWEET CHEETAH WITH CARAMEL PIKLE so cute & handy for everyday life. I would want it to be fully loaded, so whatever I needed it would always be in my Pikle. SWEET CHEVRON WITH CORAL PIKLE! I love these and NEED one for when my twins come and I have three kids under 2! I would want bandaids, Neosporin, q-tips, adult and kids pain medication, rubber bands, and all the other good things you listed! Pepper tangerine with polka dots pickle! I’m so tired I can’t even think what I would want in it…so I’d want them to fill it for me! I love that pepper tangerine with polka dots! I would choose the Dill Pikle – Red Floral with Blue Circle. I have 3 young boys so mine would definitely include wipes, bandaids, and Neosporin! The sweet chevron with coral pikle. Great post. I have two kiddos and still haven’t broken down and paid for a video monitor. I definitely want to when I have a third, so it’s nice to hear about what’s out there. As far as the Pikle bags go (which are a great idea) I like the Pepper Pikle in black. I’d put wipes, nail clippers, pocket knife, crayons, bandages and things of that nature in it. Congrats Angela! You won. Please respond within the next 48 hrs to claim your prize! I would love the pepper pickle black or red… These are great! It would be great with a starter pack! I like the Dill Green Circle Pikle. I made something similar once but it wasn’t nearly this cute. Would love to win one. I like sweet pickle in multistripe with aqua. So versatile and cute. Having two children in their twenties and one who is five, you’d think I’d be experienced. It’s like being a first time mom all over again! We’re always on the go and in a hurry. I’m always forgetting something. Great idea. Thanks for letting us know about it. I love the sweet pikle b&w floral with lime flap. Oh my favorite is the GHERKIN BLACK BUNDLE with INTERIOR POUCHES! So neat! These are so cute and handy! Great post! I really LOVE the Sweet Purple Floral Pikle! I like the essential pack! Love the green circle Pikle! Would fill it with items needed for travel……we never fly and in June we are flying to Seattle! Found you fron Pinterest! I really like the Dill Pickle in Coral Paisley. The Complete Refill pack should cover any need you would encounter! Awesome! !